8/5 Cup of Coffee: Anthony Ranuado had an impressive Pawtucket debut, while Greenville overcame six errors for a comeback victory. Portland and Lowell both fell due to their pitching. Ranaudo's PawSox debut was successful, as he led Pawtucket to an 8-1 victory over the Buffalo Bisons (TOR). The right-hander tossed six innings, allowing just four hits, while striking out five to pick up his first Triple-A victory. Brock Huntzinger added two innings of relief, allowing an unearned run on two hits. Chris Carpenter pitched a scoreless ninth inning. With the game scoreless in the second, Tony Thomas laced a two-out RBI double to give the PawSox an early 1-0 advantage. In the fifth, Pawtucket expanded their lead to 5-0 on RBI singles from Jeremy Hazelbaker, Jonathan Diaz, Xander Bogaerts, and Dan Butler. Butler added an RBI double in the ninth that brought in the PawSox' final two runs. Every member of the Pawtucket lineup had at least one hit, and every player except Butler struck out at least once. Portland's pitching was not as strong as it was a day earlier, as the Sea Dogs fell to the Bowie Baysox (BAL), 6-4. 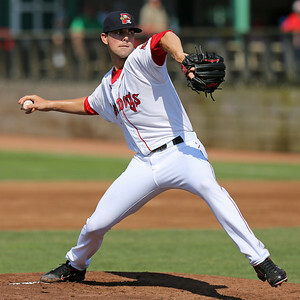 Jeremy Kehrt received the start for the Sea Dogs, hurling 4 1/3 innings and allowing four runs on seven hits and two walks, while striking out four. Miguel Celestino dropped to 1-8 on the season, as he allowed one run on one hit and a walk in 2 1/3 innings of relief. Shannon Wilkerson's sacrifice fly in the third gave Portland a 1-0 advantage. Bowie responded with two runs each in the fourth and fifth innings to secure a 4-1 lead. Christian Vazquez's RBI single in the sixth and J.C. Linares' solo home run in the seventh tied the game briefly at 4-4. With two outs in the bottom of the seventh, Bowie brought home two runs to pull ahead, 6-4. The Sea Dogs were just 1 for 6 with runners in scoring position, with Vazquez and Heiker Meneses leading the Portland offense with two hits each. Greenville snapped a four-game losing streak, as the Drive overcame a poor defensive showing to claim an 8-6 victory over the Savannah Sand Gnats (NYM). Luis Diaz received the start for the Drive, tossing four innings and allowing five unearned runs on five hits, while striking out three. Raynel Velette added two innings of scoreless relief, giving up two hits and striking out four. Gerardo Oliveres picked up the victory, surrendering a run on one hit and two walks in two innings of relief. Down 5-0 in the third, the Drive broke through for their first run, courtesy of a Jesus Loya RBI double. In the seventh, an RBI single from Jayson Hernandez and a run-scoring error allowed Greenville to pull within two, 5-3. Down 6-3 in the eighth, the Drive plated five runs on a Mario Martinez RBI single, a three-run home run from Kendrick Perkins, and a solo home run from Hernandez. Greenville overcame six fielding errors, 13 strikeouts, and an early hole to take home the victory. The home run for Hernandez was his first of the season, while the home run for Perkins was his first this year with the Drive. Lowell had a tough day on the mound, as the Spinners were pounded by the Batavia Muckdogs (MIA), 11-3. Ty Buttrey fell to 3-2, as he allowed three runs on six hits in five innings of work. Dylan Chavez gave up four runs on five hits in just an inning of relief. Carlos Pinales easily had the toughest outing of his season, allowing four runs on four hits and a walk in his lone inning of work. The Spinners runs came courtesy of a wild pitch, a Danny Bethea RBI single, and an RBI ground out off the bat of Miguel Rodriguez. Player of the Night: Anthony Ranaudo, who made his Triple-A debut Sunday night after receiving a promotion from Double-A Portland. Ranaudo earned the victory, pitching six scoreless innings, while allowing just four hits and striking out five. He was efficient on the mound, hurling 65% of his pitches for strikes. The 6-foot-7 right-hander was 8-4 with a 2.95 ERA in 19 starts for the Sea Dogs. His stellar season earned him spots in the MLB Futures Game as well as the Eastern League All-Star game. Photo Credit: Anthony Ranaudo by Kelly O'Connor. John Gray is a Staff Writer for SoxProspects.com. Follow him on Twitter @JohnRGray.